In their quest to make positive contributions to sustainability as a global manufacturer, ORAFOL is changing some of its core products and practices. 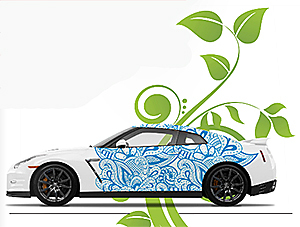 The latest is a new premium cast vinyl designed to appeal to sign makers, installers, and customers who want to minimize the environmental impact of looking cool in a wrapped vehicle. The new product from ORAFOL carries all the benefits of ORAJET Rapid Air media without the drawbacks of PVC and plasticizers. You get ease of application and excellent print quality plus the knowledge that you’re helping take care of Planet Earth. Here’s a brief introduction to ORAJET 3981RA. ORAJET 3981RA is ORAFOL’s new PVC-Free wrap media. The 2 mil cast face film is Polyurethane and is free of both polyvinyl chloride and plasticizers. The primary benefit of this film comes into play not when you apply it, but when you remove it. What happens to all those discarded wraps two or three years down the road? When a wrap made from 3981RA is replaced, its impact on the environment will be more earth-friendly. It’s not just another hunk of PVC headed for the landfill. One Polyurethane wrap is insignificant in the global scheme of, well the globe. But multiplying that impact by the tens of thousands of wraps that are replaced each year gets some people motivated to change the equation. For those people, a PU film like 3981RA is a move in the right direction. In addition to its PU face film it has some familiar features. The gloss finish supports excellent print quality. You may need to print at a slightly higher resolution to achieve image quality similar to your existing PVC film, but the high gloss levels and white point support excellent print quality. The RapidAir air egress release liner and repositionable adhesive support quick and easy application of bubble free wraps and graphics. According to Wrap Institute speed wrap guru Justin Pate, PU films are generally more flexible than PVC. So your installers may find that it’s faster and easier to install. They’re also more durable. ORAJET 3981RA is rated for ten years outdoors, so if your application is something less transient than vehicle graphics, this film is up to the challenge. 3981RA is suitable for both eco-solvent and Latex inks. ORACAL has ICC Profiles available for both options including a 720dpi FlexiSign profile for the MUTOH ValueJet 1624. And, since no responsible wrap installer applies vinyl without abrasion protetion, ORACAL offers a matching overlaminate. ORAGUARD 289F is a 2mil glossy clear Polyurethane overlaminate film on a 1.4mil polyester release liner. Like 3981RA, it’s PVC and plasticizer free. ORAJET 3981RA and ORAGUARD 289F are available in 54″ x 50 yard and 60″ x 50 yard rolls. The price of greener wraps is about $2.07/sq ft for the vinyl and overlaminate, so it’s a little more expensive than a comparable cast vinyl. Unless you live in Seattle or SanFrancisco, you may not be able to sell all your wrap customers on the PVC-free alternative. But, as the public’s desire for environmentally friendly solutions grows, PU wrap media may become a more important part of your product line. If you’re ready to take a step toward sustainability, your journey starts here.